As predicted, there was a role for health care issues in voters’ 2012 election decision, but Kaiser’s November Health Tracking Poll—fielded in the days immediately following last week’s presidential election—suggests it was a trailing issue rather than a leading one. To keep the issue list in perspective, the November survey first asked voters to name the top two factors in their vote in an open-ended question, without providing answer choices. Here we confirm the importance of the candidates’ personal characteristics in voters’ decisions: for both those supporting President Barack Obama and those backing Governor Mitt Romney, it was the voters’ sense of the characteristics and records of the candidates themselves rather than any one issue that was at the top of their minds. Taken together, health care issues came in third (or tied for third) among both groups, volunteered by 16 percent of Obama voters and 13 percent of Romney voters as one of the two most important factors in their vote. More specifically, eight percent of all voters mentioned something about the Affordable Care Act (ACA) as important to their vote, either pro or con, while one percent volunteered something about the Medicare program and the same share volunteered Medicaid [see question 5/6 of the topline for full results]. Interestingly, while the economy and jobs were just as important as the candidates’ own strengths for Romney voters, it was named by significantly fewer Obama voters. As previous months of Kaiser polling have shown, however, when voters talked about ‘health care’ they were talking about much more than the ACA, even though the signature Obama administration legislation looms large for those deeply immersed in the latest health policy developments. 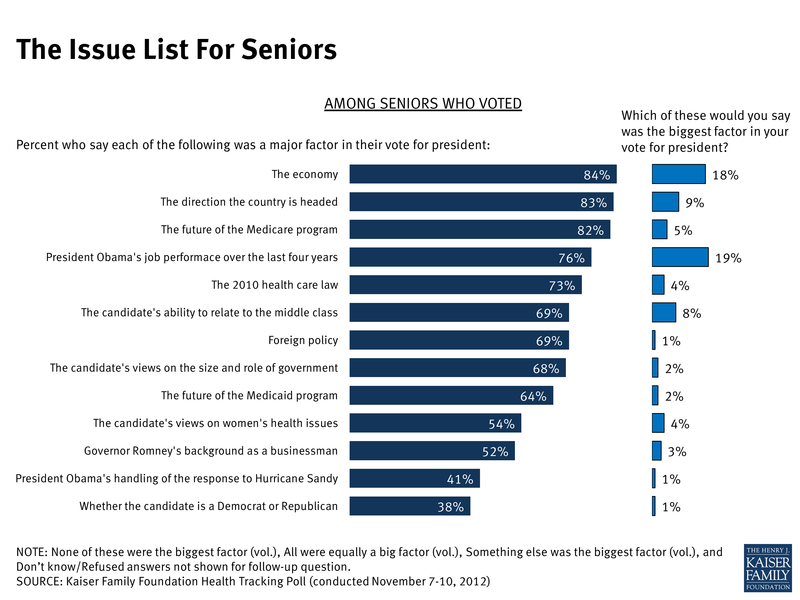 When voters were asked to assess the importance of a lengthy list of issues to their votes, large shares named a variety of health issues as a major factor in their vote, including: the future of the Medicare program (70 percent), the ACA (69 percent), the future of Medicaid (61 percent), and the candidates’ views on women’s health issues (57 percent). Pressed to choose among this admittedly long laundry list of issues, voters splintered in their priorities, and no health care issue garnered more than single digit support as the biggest factor in their choice in 2012. That honor was saved for the economy (19 percent), the direction of the nation (15 percent), and President Obama’s performance during his first term (15 percent). Did Health Care Issues Benefit One Candidate Over The Other? The national exit poll1 conducted by a consortium of major media organizations on election night also found health care in the mix as a second tier issue (18 percent picked health care from a list of four possible issues, compared to 59 percent that picked the economy), and suggested that health care voters were much more likely to have voted for President Obama than for Governor Romney. Kaiser’s November tracking survey also found voters that volunteered a health care-related issue as one of the top two factors in their choice gave the edge to President Obama, 55 percent to 41 percent, though by a significantly smaller margin than the exit poll found in answer to a closed-ended version of the most important issue question. 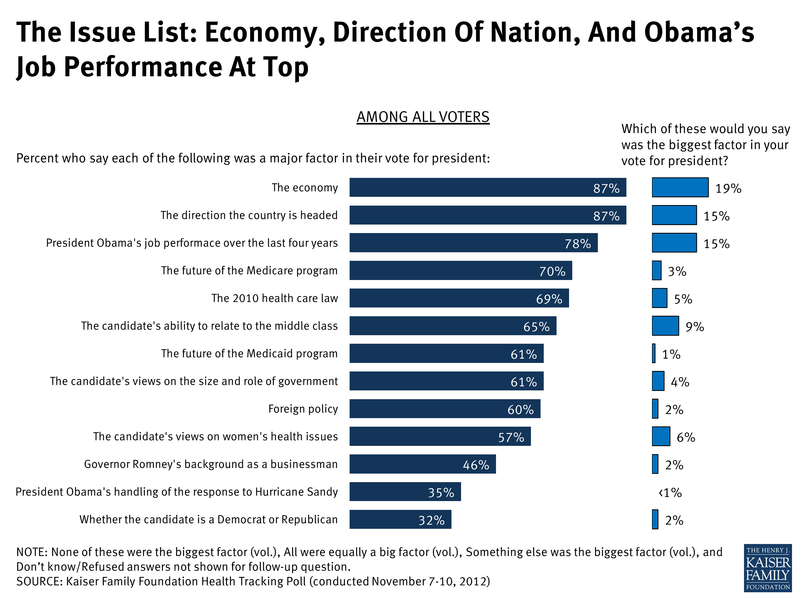 Among the much larger groups of the electorate that did not necessarily name a health care issue as the “biggest” factor in their vote, but still agreed that a variety of related issues did play some role, President Obama’s edge over Governor Romney varied. For example among those that agreed women’s health or Medicaid played a role, the incumbent had a double digit advantage over his challenger (28 percentage points and 13 points respectively). On one of the other controversial issues of the election, the 70 percent of voters that said the future of Medicare played some role in their vote went for President Obama somewhat more narrowly, 50 percent compared to 41 percent for Gov. Romney. Finally, the two candidates were tied among those voters that said the ACA was a major factor in their vote, suggesting that the controversial health law worked both ways in the election. According to the November tracking poll, supporters of the law were just as likely to name it as a factor in their vote as opponents, suggesting it motivated both sides on the issue in equal measure. Women were a key constituency in the president’s win and women’s issues, including those related to their reproductive health choices, were a small, but measureable factor for this group. Six percent of women voters specifically mentioned women’s issues as one of the most important factors to their vote in the open-end, compared to one percent of men. Two-thirds (65 percent) of female voters rated “the candidate’s views on women’s health issues, including birth control and abortion” as a major factor in their vote choice (compared to about half of men), with eight percent naming it as the biggest factor. Seniors have been an interesting group to watch this election cycle: previous polling shows that they have been more likely than others to prioritize Medicare in their electoral choice, more likely to oppose changing the program to a premium support system along the lines proposed by Gov. Romney and his running-mate Congressman Paul Ryan, but at the same time more likely to give Gov. Romney a small edge as the candidate they trusted with the future of the program. This new post-election poll finds similar results, but also echoes the theme above that health care wasn’t moving extremely large portions of any segment of the electorate this year. There was an age gap in prioritizing the nation’s primary health program for retirees: A large majority of voters aged 65 and older said Medicare’s future was a major factor in their vote (82 percent), 16 percentage points higher than among younger voters. But, as was true nationwide, few senior voters named it as the ‘biggest’ single factor in their vote choice (5 percent), and in the open-ended item, only 12 percent of seniors named any health issue as one of the primary elements in their decision, with only one percent offering up Medicare specifically. Meanwhile, though seniors have remained somewhat more skeptical than younger Americans of the Affordable Care Act, the November survey finds them more in line with the rest of the public on the 2010 law, with 40 percent favorable versus 40 percent unfavorable and the remaining two in ten not offering an opinion. According to the national exit poll, Gov. Romney won among seniors by a comfortable margin. Even so, more of those aged 65 and up say that President Obama’s policies will be good for seniors as a group than expect they will be bad (47 percent versus 33 percent). Similarly, somewhat more seniors expect his policies will be good for the Medicare program than bad (45 percent compared to 35 percent). 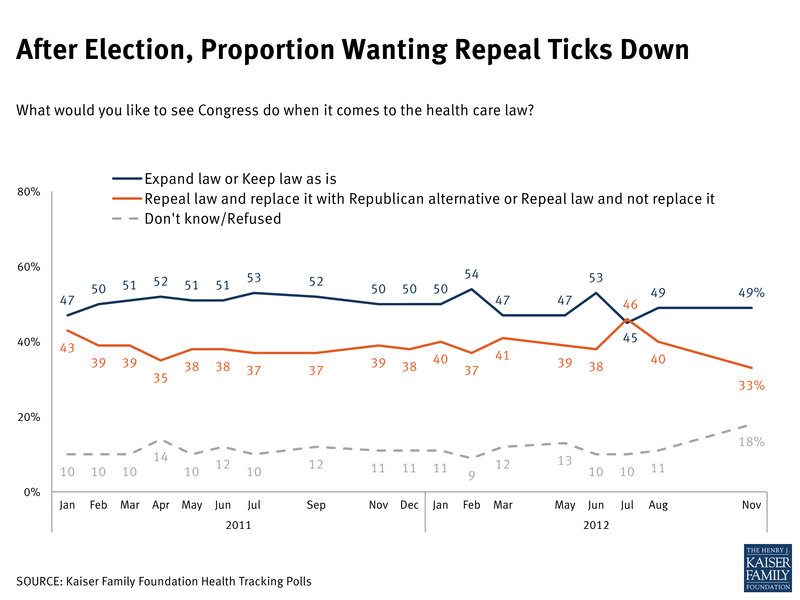 Meanwhile, not even a presidential election can disturb the relatively stable opinion trend on the Affordable Care Act. Looking among the American public as a whole in the days after the long race ended, the November survey found the public comfortably in the relatively narrow band that we have seen since passage of roughly split views. 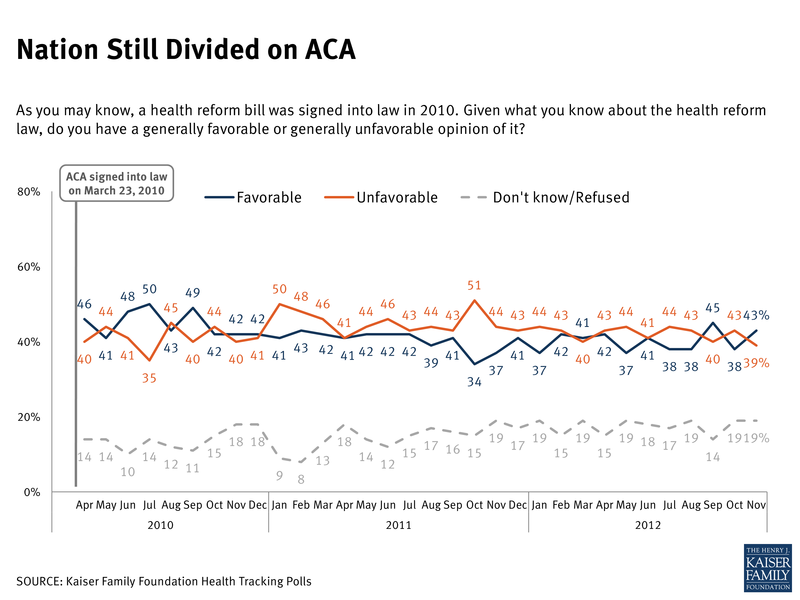 Meanwhile, not surprisingly, three-quarters of Obama voters reported having favorable views of the ACA, while eight in ten Romney voters reported the opposite, with 65 percent saying their views of the law were “very” unfavorable. 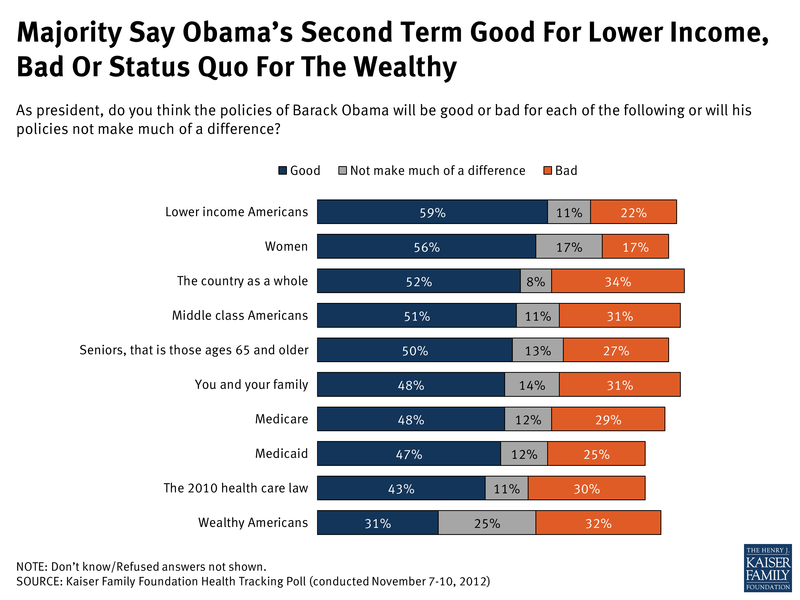 A clear majority of Americans anticipate President Obama’s second term will be good for lower income Americans and for women, while Americans are quite divided on what it will mean for the wealthy. In terms of health issues, more think President Obama’s policies will be good for Medicare, Medicaid and the ACA, than think they will be bad.